Zainab was honestly the best driving instructor I could have asked for. 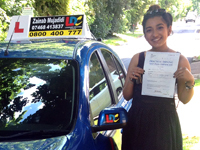 I had only two two hour lessons the days before my driving test, and I passed first time round. Zainab played a huge role in this. She made me feel calm and comfortable, while telling me where I needed to improve. The little things she would say to me during my lessons stuck in my head during my test, like 'new road, new mirrors'. I feel blessed to have Zainab guiding me before my test and will be recommending her to anyone looking to drive!